Have you ever stolen a glance at one of your kids while she’s in the midst of an activity – a routine, unexceptional activity – and felt a love so intense it takes your breath away? I don’t know about you, but I don’t tend to experience such overwhelming feelings very frequently. When that rare pang hits, it takes me a minute before I realize what’s happening. My love for my girls is constant and true, but it’s not always visible. I don’t wear it on my sleeve. It lurks in the background. I often string together in my head fleeting moments in time that tell the story of their young lives. My mind will wander to Sophie’s latest arts & crafts creation, the feel of her smooth cheek against my calloused palm, the grunts she makes when she wants something but expects me to use my mama ESP to guess what that something is, the homework she struggles to complete because she’s so done with school. I’ll turn my thoughts to Chloe’s goofy smile when she’s texting her friends, her obsession with books, our shared love of movies, her exasperating inability to prevent her room from looking like the set of a dystopian film. Sophie caught me by surprise a few weeks ago. I was sitting at my desk, gazing out the picture window that overlooks our deck and our backyard. It must have been mid-April. The weather was still unpredictable and hadn’t made its final transition to spring. It was depressing. This particular day, however, was one of the first good ones. The sun was shining. It was tantalizingly and deceptively warm. Sophie had recently discovered the joy of blowing bubbles in Truffle’s face. 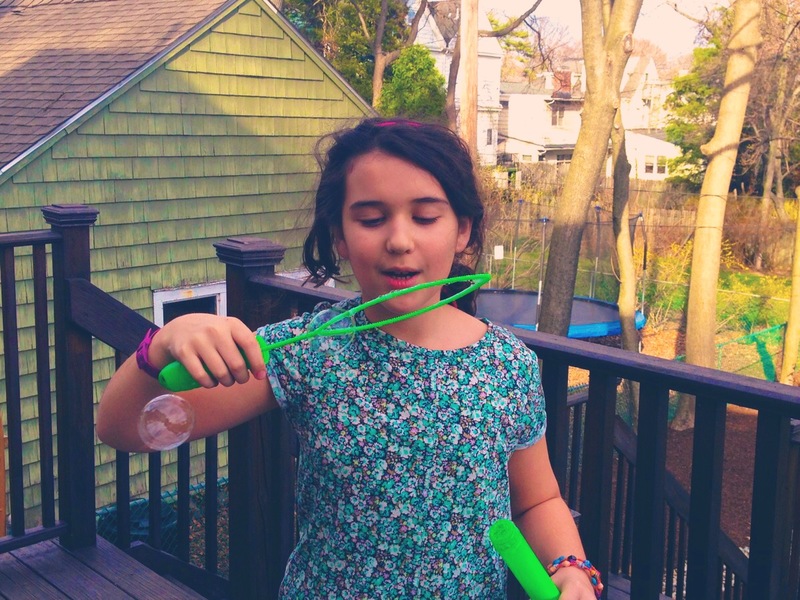 She was in front of the desk window outside, driving the dog crazy with her bubble wand. I heard the laughing and the barking before I looked up from my computer. And when I finally tore my eyes away from the screen, I saw Sophie in front of me. She was oblivious to my gaze, happily trying to form the biggest bubbles she could. Her face glowing with a coy Mona Lisa smile, she was at ease in her own little world. I silently observed her for a few seconds, watching as her barely upturned lips transformed into a toothy grin. I stared at her for a few minutes. And I was so overcome with feelings of pride, love and tenderness toward my little girl that my eyes welled up. I basked in the scene a little longer and quickly pulled myself together. I wanted to remember this. I grabbed my phone and discreetly took a couple of photos. On the occasion of Sophie’s 9th birthday last year, I wrote about her kid essence – how she continues to act her age, still very much a child. 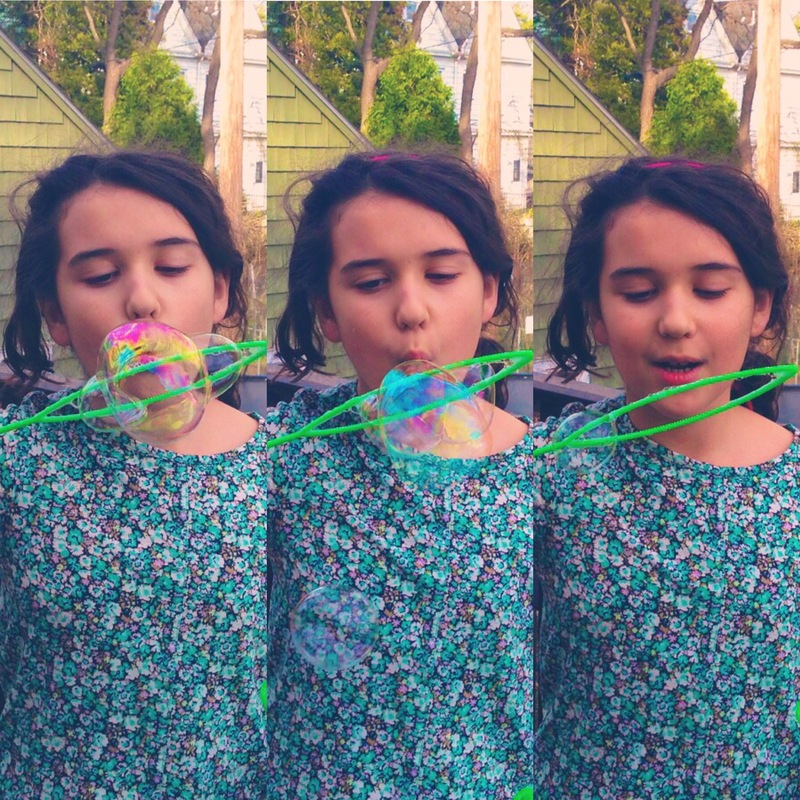 Her fun with the bubbles was the perfect example of that priceless quality – and it moved me because I don’t know how much longer it will last. Her body is changing. She’s becoming more private. She embarrasses more easily. Her emotions are wildly unpredictable. Adolescence has arrived for a second time at our doorstep and I’m not quite ready to let it in and possess my youngest daughter. If you’re anything like me, perhaps you sometimes find it hard to live in the present, too often getting caught up in small worries or thinking too much about the future, at the expense of enjoying the here and now. For a few all-too-brief minutes last month, Sophie brought me into her moment, completely unaware that she had given me that most precious of gifts: a reminder that the present will become past soon enough and tomorrow can most definitely wait. Thanks so much for stopping by – have a wonderful day! This may be my favorite post ever. I think most moms can identify with that unexpected moment when they choke up with love for their child because of just such a simple moment. Beautifully written. Thanks, my dear friend. I’m glad you related to it and enjoyed it! Beautifully written. I could feel so much love oozing out of your writing! Yes, indeed. I feel the same sometimes when I unexpectedly catch my kids’ expressions when they are not looking. Thanks so much for taking the time to read and comment, Ann. I’m glad you liked it and can related – I think many of us experience these feelings from time to time! Yes, this is beautiful. Help people to preserve that childhood that can exist well into adulthood. Thanks so much for taking a few moments out of your day to read my post – I’m glad you liked it! Yes, well, it’s always those moments when you’re not looking for something special that these types of feeling really grab you. And it is the simple things, like blowing bubbles. Sometimes it’s just seeing one of my kids reading a book or watching ants in an anthill. Hi, Sarah. Thanks for stopping by! Yes, it’s definitely the simple things – anthills, too (although my 14yo inherited my terror of ant colonies…). It’s amazing how our children instinctively know how to be fully present and find joy in little things. I’m glad you recognized the precious moment your daughter was giving you and shared it with us. I not only felt your love for your daughter, but your presence in that moment. Lovely post. Thanks so much, Kate, for your kind words. Now I just need to learn to be more mindful so I don’t miss these moments when they pop up again! The thing about our children and their ability to be fully present is that they call us to ourselves. You’ve done a beautiful job of making this blessing present to us all, Jennifer. Thank you so much, Paula, for taking the time to read and comment. Your kind words arrived at just the right time – the new essay I’m posting this morning is about the insecurity I’ve been feeling lately as a writer. Your comment has given me a much-needed boost! That’s so well-put! I was enjoying a walk with my daughter today. I’m so fascinated by her and her interests and dreams and by the many ways we are alike. Thanks, Bill. It is a pretty amazing thing, isn’t it? Even when they drive us crazy. I read this today because I saw it retweeted and thought hey, if someone liked it, it must be a good post. I was instantly in your little story seeing myself with my own girls. They are 2 & 4 and I absolutely get caught up in the little worries of day to day. This is a great reminder. Great post!! Thanks so much for taking time out of your day to read the post. I love tweets that serendipitously lead me to new writing – and I’m thrilled you found your way to my post and liked it. 2 & 4 – I remember those days with great fondness! Thanks so much! I appreciate your taking the time to comment on my blog. I love the way you capture the poignancy and the humor of being a mom.